Pu-erh or Pu'er tea is a variety of fermented dark tea produced in Yunnan province, China. Fermentation is a tea production style in which in this case the tea leaves undergo fermentation and oxidation after they are dried and rolled, giving Pu Erh that unique earthy, woody character. The Organic Yunnan Pu Erh come from the mountainous southern Chinese region of “Yunnan” which borders Myanmar, Laos and Vietnam. The tea plants grown in this region are of a much larger leafed variety than the type grown in the other regions of China which have much smaller leaves. The most famous tea from Yunnan is Pu Erh, a specially fermented Black tea which has an earthy, woody character. Fermentation is a tea production style in which the tea leaves undergoes fermentation and oxidation after they are dried and rolled. The liquor has a Ruby red colour. The tea can ripen with age, and can be cellared under controlled conditions just like wine, this is very popular in China where professional cellaring is carried out under controlled temperature and humidity for the best qualities, which then fetch astronomical prices. This black Chinese tea can generally improve in taste over time due to this process. Teas that can be aged finely are typically made from high quality leaf; processed skillfully and stored properly over the years. As a digestive, nothing is better, more satisfying or more calming than Pu-erh tea from China's Yunnan province. An aged, fermented tea, Pu'erh has clean, mellow, earthy qualities and is particularly good after a multiple-course feast like a Thanksgiving or similar heavy holiday meal. There is very little Organic tea produced in Yunnan province, and this makes this tea very rare and unique tea too. 100% Chinese Fermented Organic Black Leaf Tea. 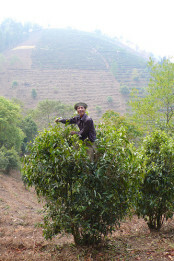 There is very little Organic tea produced in Yunnan province, and this makes this tea very rare and unique. Use freshly drawn boiled water. Infuse one tea scoop per teapot and allow to brew for 3-5 minutes… for those of you that want to be exact 2.5g to 200ml of water. a specially fermented Black tea which has an earthy, woody character. Iced Tea with a Kick! Very efficient service, and the most wonderful teas I have ever tasted! Service rating : I placed my order late Sunday evening 4/218,it arrived early Tuesday 6/2/18.Everything was nicely packed.very pleased.What a very efficient service.they have a very good selection of teas and accessories. Hope to order again. Product : Sounded interesting, so thought i would try... Service rating : I placed my order late Sunday evening 4/218,it arrived early Tuesday 6/2/18.Everything was nicely packed.very pleased.What a very efficient service.they have a very good selection of teas and accessories. Hope to order again. As always, the teas are excellent. Shipping was faster than I anticipated. No problem with the tea - have been drinking for ages, but purchasing from another online retailer, which I may just do again. The only problem I had was with the postage - it took one week round before I received my tea whereas my other retailer is usually two days and in the last case I... No problem with the tea - have been drinking for ages, but purchasing from another online retailer, which I may just do again. The only problem I had was with the postage - it took one week round before I received my tea whereas my other retailer is usually two days and in the last case I ordered from them was there the very next day. The tea is one of the best I've ever tried. The service was fast and the teas arrived perfectly even after their overseas travel. An excellent service, tea was well packaged and arrived quickly. As always the tea is exceptional quality, I haven't tried the Pu Erh or Lapsang Souchong yet, but the Breakfast Tea and Belfast Brew are established favourites and this is our first try of Russian Caravan and I love it. Thank you for your feedback! We really appreciate hearing back from our customers.